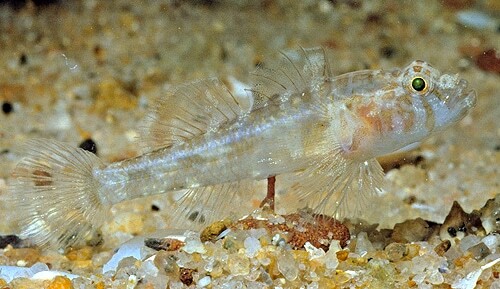 A female thalasseleotridid, a member of the newest family of fish. A University of Sydney taxonomist has built on the research of Emperor Akihito of Japan, perhaps the world's best known ichthyologist, to classify a new family of fish. The classification of the new family Thalasseleotrididae by Dr Anthony Gill comes after careful re-examination of the three species included in the family, one of which was first collected in Port Hacking near Cronulla in the early 1980s. The three species were previously considered part of the family Eleotrididae, commonly known as gudgeons or sleepers, a group of small bottom-dwelling fishes that occur in estuaries and freshwaters throughout the world. But Dr Gill, Natural History Curator at the Macleay Museum, and fellow researcher Dr Randy Mooi of Manitoba Museum, Canada, have examined numerous gudgeon specimens and found unique characters (identification characteristics) warranting the naming of the new fish family. Their findings have been published in the latest edition of Zootaxa (PDF, 723KB). Dr Gill says the differences between Thalasseleotrididae, found in temperate Australian and New Zealand marine waters, and the predominantly freshwater and estuarine gudgeons in the family Eleotrididae are in their bones. "It's the shape, and presence or absence of certain bones in the pectoral girdle and gill arches that make thalasseleotridids stand out from other gudgeons," he says. "Some of these characters were already discussed by Emperor Akihito in the 1960s and 1980s, but their significance wasn't fully appreciated." With only a little over 500 fish families recognised worldwide, the proposal of a new family is a rare event in ichthyology. However, Dr Gill emphasises creation of the new family is a refinement as much as it is a discovery. "In my field finding characters is critically important and offers something for others to build on. The guts of our contribution is in the reinterpretation of existing characters first identified by Emperor Akihito, as well as the proposal of new characters we have discovered. All of the characters are now there for critical re-examination by future workers. "We were the first to pull together large collections of these fishes so we could compare anatomies and finally see how broadly distributed each character was." Dr Gill's ongoing work will build upon his latest discovery by looking further at the relationships of gobioids, the larger group (suborder) of fishes to which gudgeons belong. Gobioids include about one-tenth of all known fish species, and include some of the smallest known vertebrates.